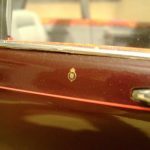 For most of her reign the Queen’s state limousines were Rolls Royces, but when Elisabeth II had her Golden Jubilee on the British throne in 2003, BMW did not yet have the rights to the brand name and was to re-launch the Rolls Royce brand, so VW-owned Bentley seized the opportunity to earn royal patronage. 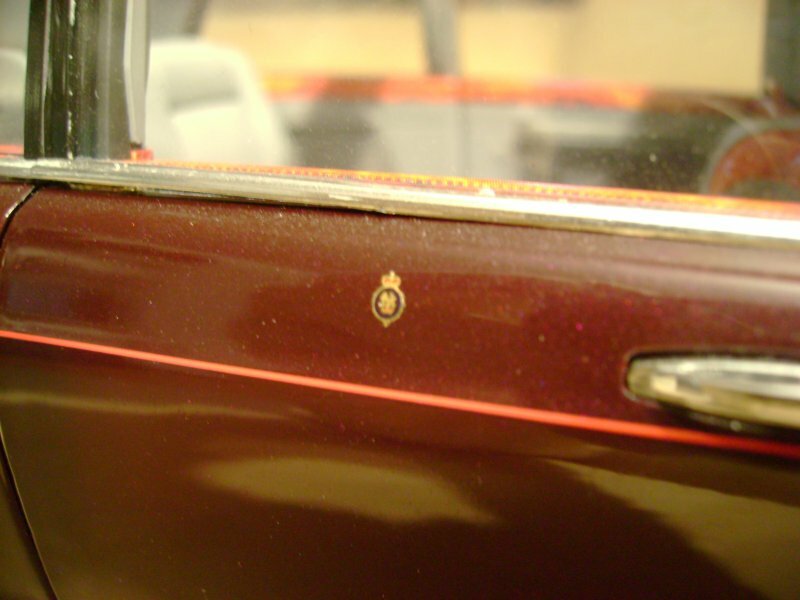 Unlike the Silver Jubilee Phantom, the Bentley state limousine(s) is/are a custom-built one (two) off (in fact there are two identical vehicles). 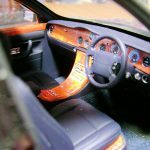 There is absolutely no likeness to the contemporary Arnage and Mulliner were able to showcase what they are able to achieve. 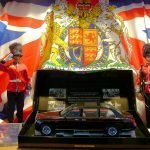 Fulfilling Her Majesty’s direct input, the body is kept very traditional and resembles the lines of previous state limousines by Rolls Royce. And honestly, I cannot possibly picture her in a BMW Phantom Roller. 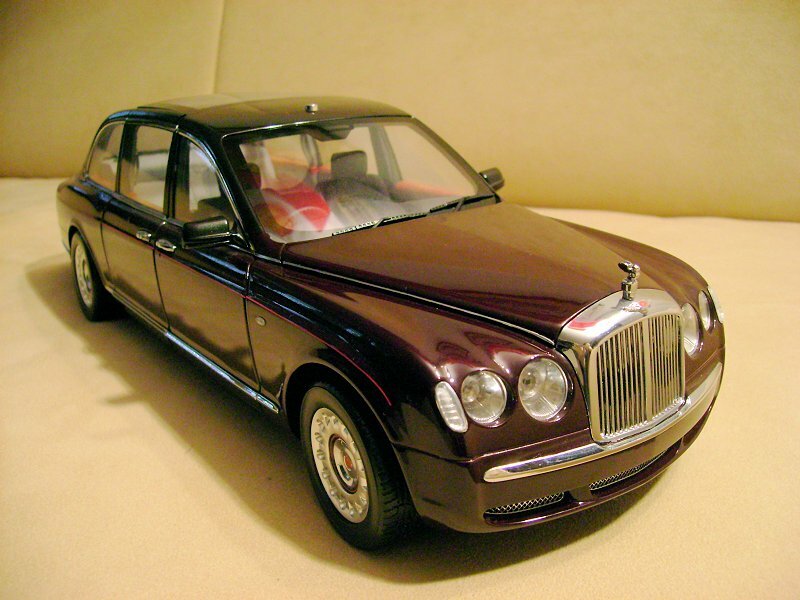 Back in the days when Minichamps was making benchmark-excellent diecast models and the first Bentleys including exclusive Bentley Dealer models because Paul’s Model Art owner Paul Günter Lang himself drove and loved Bentley, Minichamps made a case of making this special model and wrapping it up as if the model itself was a Golden Jubilee present. 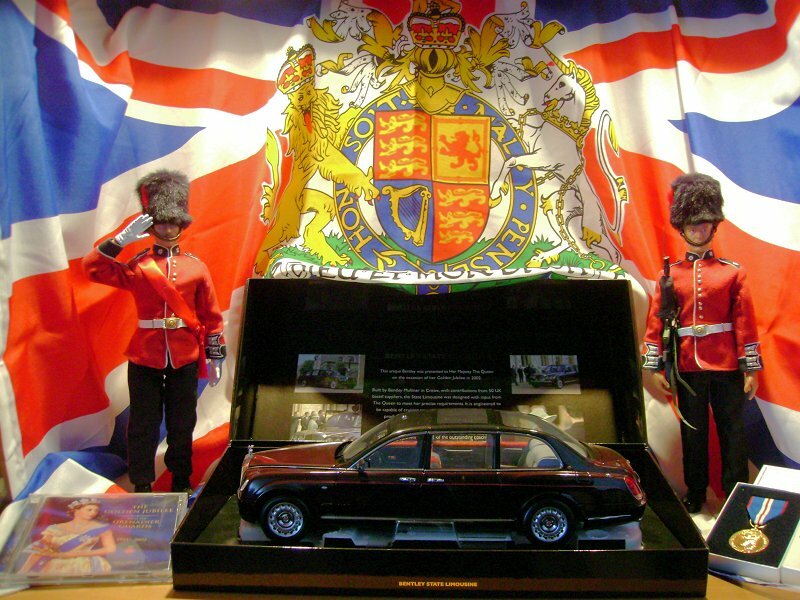 Of course the royal standard, the Guards, the CD and the official Golden Jubilee Medal are my accessories, but the presentation box with pictures of Her Majesty being presented with the actual car at Windsor Castle is much more glorious than Minichamps usual clamp-shell styrofoam boxes at the time, and in line with other Dealership Editions. 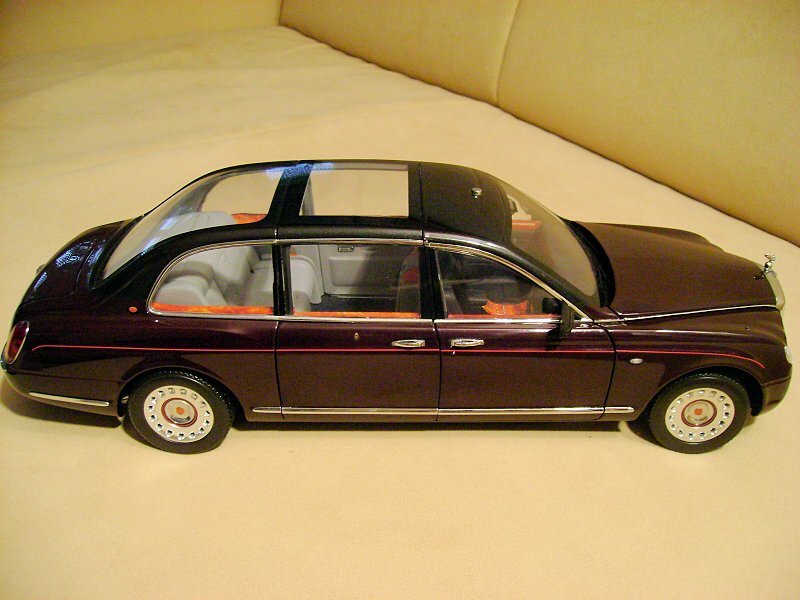 (Before the arrival of the Rolls Royce State Car I never removed it from the box). 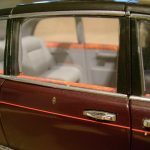 The model itself was an extra-effort of what were state-of-the-art models at the time. 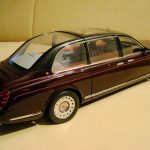 Of course, following the traditional lines, the model has a high roof, generously glassed landaulet-style in the rear, as HM insists on being visible to welcomers and bystanders upon arrival to royal visits. 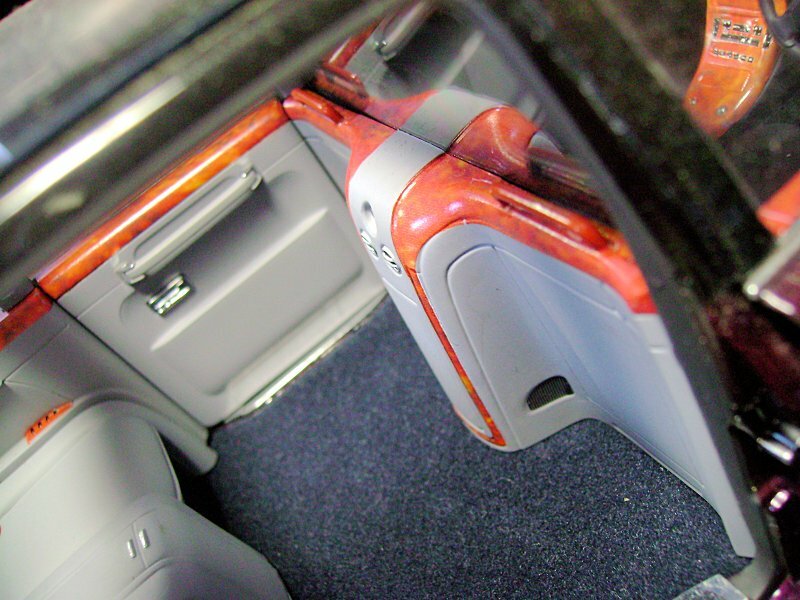 But this time, for options of more privacy, there are a roof plate and a rear window plate attachable to the model by magnets. 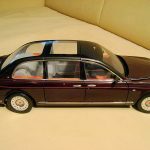 As on the original, the roof is metallic grey over the traditional Royal-Claret livery of the lower body, flawless and with tasteful chrome applications and spotless like the shiny radiator. The winged B mascot on the radiator is as presented to the Queen, although she uses her traditional personal “St. George slaying dragon”- mascot instead (what is how car mascots started, by the way). 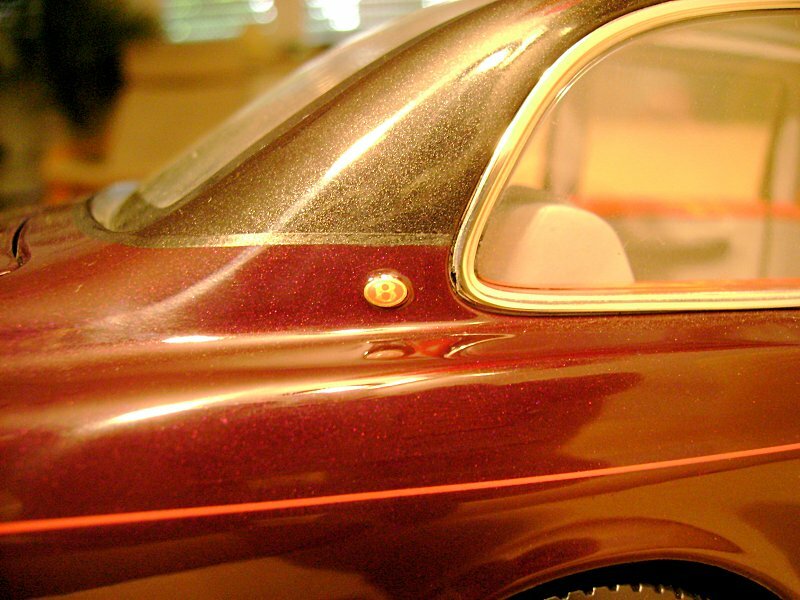 There is a fine red waistline running the length of the sides, a tiny round coat-of-royal-arms on the rear doors , a minute prominent oval red Bentley badge on the C-pillars, round at the wheel centres, winged on the boot and in front of the radiator mascot, as the car is technically based on the Arnage R. So the car proudly oozes “Look I´m a Bentley, and I´m the Queen’s car”. 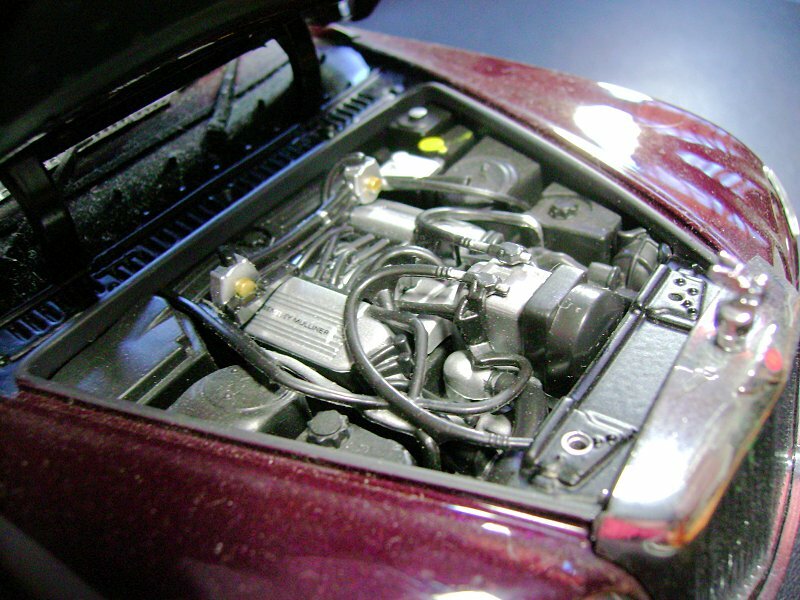 The modified Arnage R engine under the bonnet presents many more details than its siblings from Crewe’s production line. 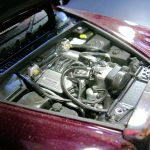 The radiator and front spoiler mesh are breakthroughs. There are even blue police lights behind the radiator’s vertical chrome bars. The chrome-rimmed lights are executed excellently and convey depth because the physically HAVE depth. 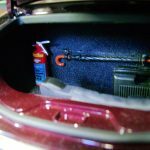 In the boot, you’ll find large umbrellas and boxes that may contain tools to be used by the chauffeur, more a traditional nod than a necessity on the modern car. 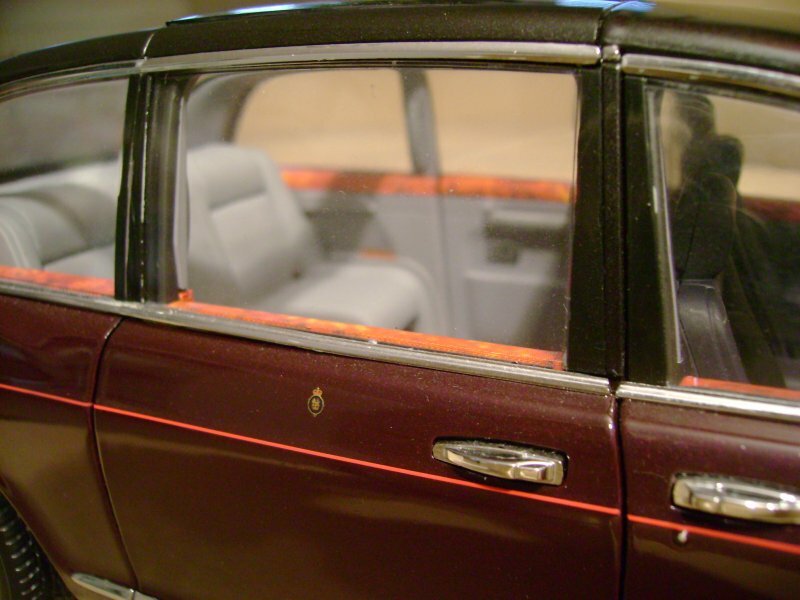 Open the rear-hinged rear doors for the regal passenger (wouldn’t it be nice to have an Elizabeth II figure for it? 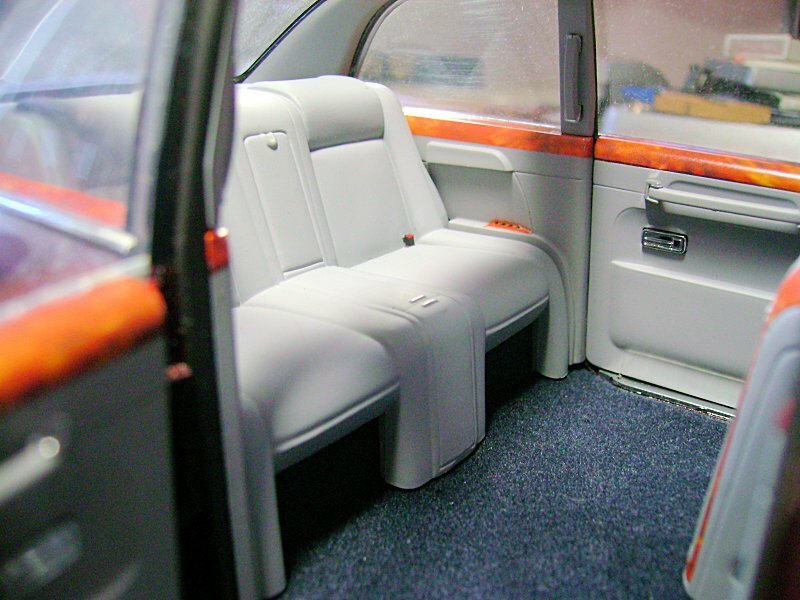 )… and you will be a bit disappointed about how sparsely this rolling royal throne is furnished. 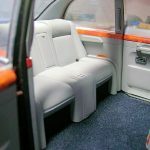 Even kids are better-entertained passengers these days, but the Queen likes to keep it simple: A blue carpet, light grey cloth (plastic on the model) and wooden window sills – the best veneer I have EVER seen on any model car (yes, that’s open to debate down in the comment section: c.f. 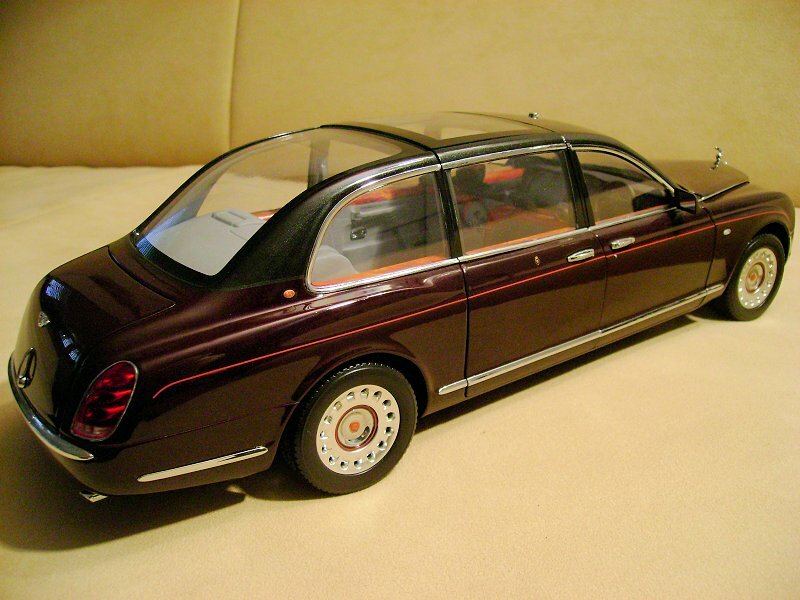 Kyosho’s Rolls Royces, Minchichamp’s other Bentleys, AutoArt’s Maybachs, you name it). And that’s really it in the rear. 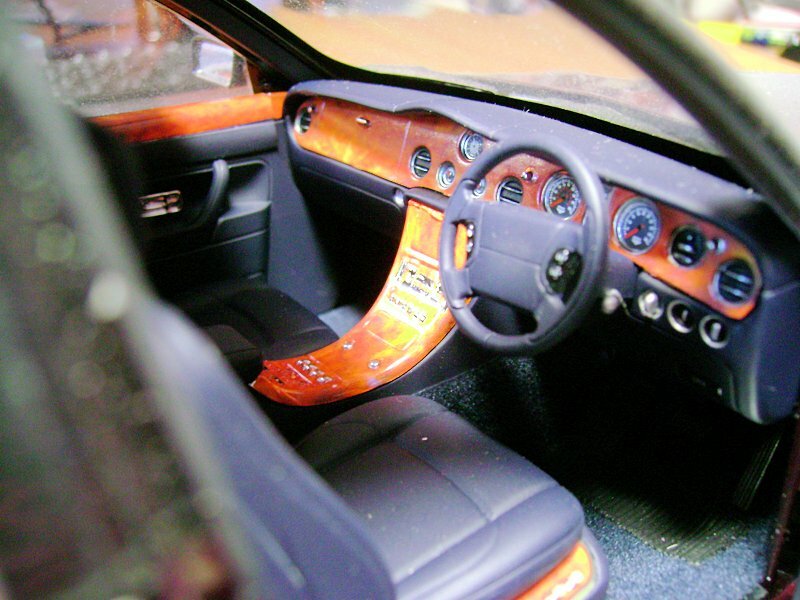 The front looks plusher and detailed with the black leather (again plastic on the model of course) seats in front of the partition glass, generous walnut veneer on the centre console, dash and door sills, with inset buttons, switches, dials, air vents, etc. 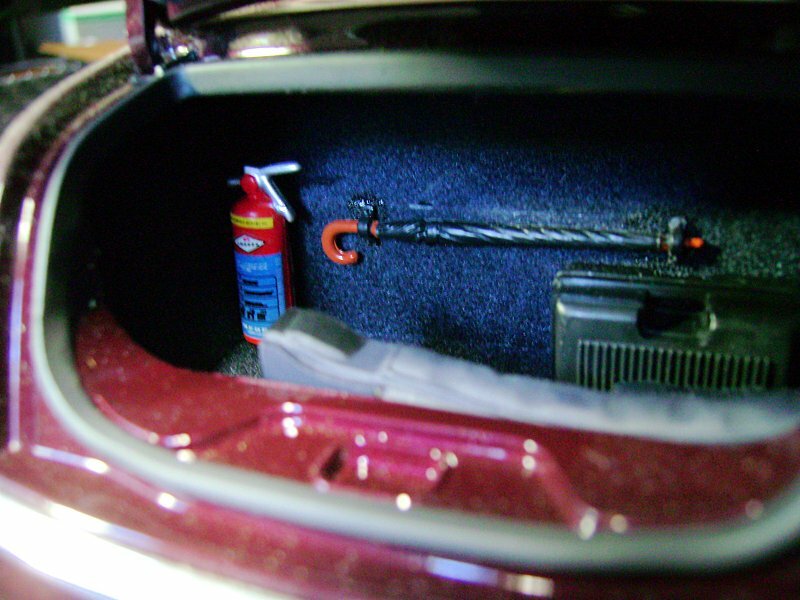 Pinch yourselves to remind you that I am reviewing a 2009 model, made almost a full decade ago. 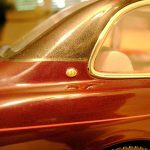 The old model shames some of the stuff shoved onto shelves today and seems to whisper: “This is what was possible, in diecast, at affordable prices” and you’ll hear a fine, almost real echo answering: “still is possible, in diecast, at affordable prices”. But that’s a different story, I guess and will trigger more comments below. 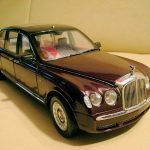 4 Responses to "REVIEW: Minichamps Bentley State Limousine"
Man alive, Minichamps have definitely steered away from this level of detail in recent years. Beautiful model. 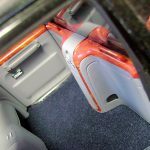 Great review and photos. Thanks, already started thinking noone is interested.